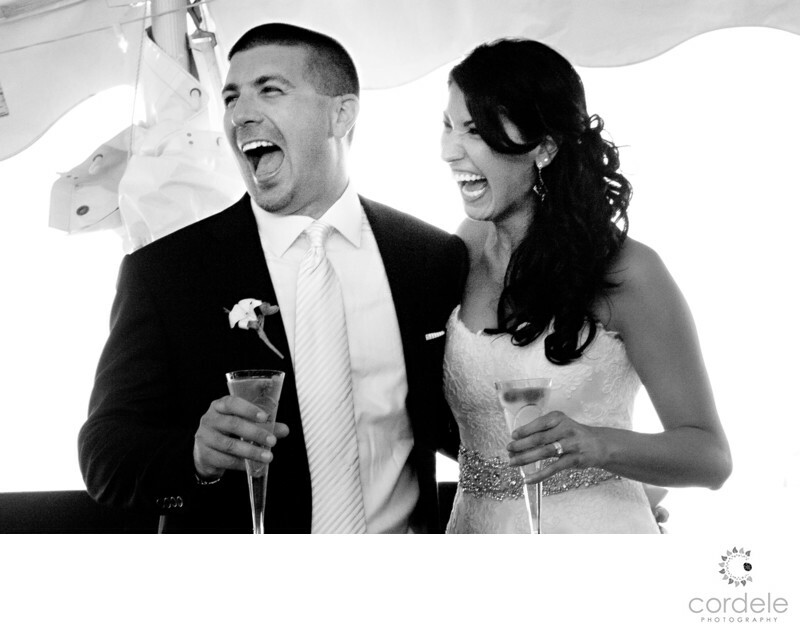 This photo is one of my favorites from Melissa and Brian's Wedding. During the toast, the Maid of Honor got up to speak. She apologized that she was reading off her iPhone. She began to read, and as she went she would have to stop and scroll to get to the rest of her toast. Halfway through the toast. Someone at the wedding, called her. Then hung up. Then they called her again. It was hysterical funny and the photo of the bride and groom captures the funniest moment at the wedding. She was getting so annoyed, but it was all in good fun. The bride and groom thought it was hysterical I missed the initial reaction as I was focused on the maid of honor but the second time I was focused on the couple. Their reaction was priceless and everyone had a good laugh. Their ceremony was held at the Atlantic Inn on Block Island and it's such a charming venue with a view. They didn't even need the tent because the weather was perfect! Block Island is accessible from Newpprt RI or Point Judith. It's a short ferry ride over, and it's not to be missed as a place to see of the New England coast! Location: The Atlantic Inn 359 High St, New Shoreham, RI 02807. Keywords: Atlantic Inn (3), block island (3), reception venue (3), Rhode Island (3), wedding (6).